A recent article in one of Turkey’s English-language newspapers, describing plans by Mey İçki, Turkey’s largest producer of rakı, to introduce the anise-flavored liquor to Europe, left us both steamed and amused. 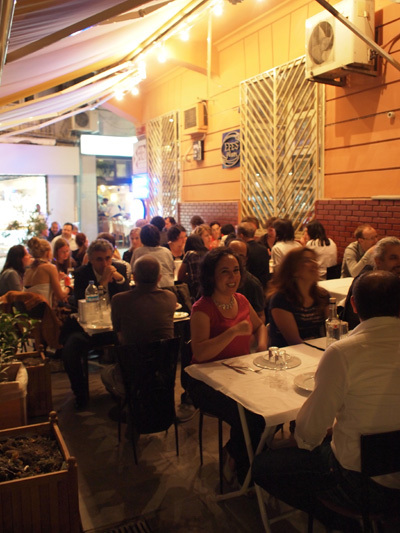 As part of its efforts to promote the consumption of rakı, it appears the company – along with an outfit called the Tourism Research Association (TURAD) – has gone into the lab and come up with something called the “modern meyhane.” In fact, the two have already opened up one of these newfangled taverns, a focus-group tested spot in Beyoğlu called Safi Meyhane, which promises on its website that it was designed to be “compatible with international norms.” We almost choked on our leblebi when we read that. “International norms”?? Is this what we’ve come to, that this most Turkish of institutions, the meyhane, now needs to conform to “international” standards? Good grief. Another line in the article stopped us cold. 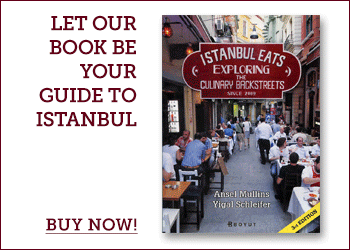 “I couldn’t help myself thinking, ‘Where are the old watering holes?’ with their rakı etiquette and their meze varieties,” the author wrote, as if some strange plague had swept across Istanbul and somehow made the city’s old-school meyhanes vanish. In response, we thought we’d offer a list of five of our favorite meyhanes, places that, despite bans on smoking and outdoor seating and ever-rising liquor taxes, still manage to keep the old-time spirit of the “rakı sofrası” (literally “the rakı table”) alive. Although the mezes and booze flow at these places, these are not culinary destinations, per se. The food is good, but the real attraction here is to be part of the time-honored ritual of sitting down with friends, cracking a bottle (or two) of rakı open and enjoying a long night of good conversation while small plate after small plate of food magically arrives at the table. Those are “norms” we can definitely live with. 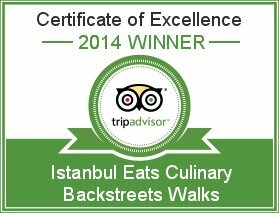 It wasn’t quite as dramatic as Meg Ryan’s big moment at Katz’s Deli in “When Harry Met Sally,” but a low-register, guttural moan of pleasure was detected from our table upon our tasting of the shredded celery root in yogurt, a house specialty meze at Beyoğlu’s Çukur Meyhane. And we weren’t faking it. We stop into scores of meyhanes, or traditional Turkish tavernas, and eat more yogurt mezes than we care to report, all for the sake of finding that one masterful meze among the goopy masses. Most mezes in Istanbul are fine, but very few can be considered orgasmic…. (to read the rest of the review click here). Not that there’s anything wrong with the food here, which is reliably well made. The meze tray at İnciraltı (which means “under the fig tree” in Turkish) is brought to your table carrying all the classics, plus a few welcome and tasty surprises, such as the zingy brined twigs of the caper plant and a sea bass filet that had been cured in a piquant sauce redolent of curry. Among the excellent mains we had sea bass again, this time grilled wrapped inside grape vine leaves, and meltingly soft uykuluk (sweetbreads), that were also grilled and dusted with oregano and red pepper. Both were winners. 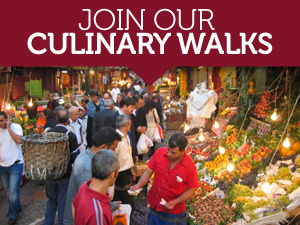 But it’s İnciraltı’s location that will have us coming back, especially if we’re looking for an opportunity to take an excursion without leaving Istanbul…. (to read the rest of this review, click here). “My heart starts pounding when a pregnant lady enters the room,” said Hüseyin, the artist turned owner/operator of Mohti, a new “Laz Meyhane” in the back of the backstreets of the Asmalımescit area. While this might sound to some like the unsavory confession of a man with an exotic fetish, to us it was a breath of fresh air, redolent with the old-style charm of a classic meyhane patron, something that’s increasingly harder to come across these days. There was a time when every meyhane around here had a true character at the helm, someone who knew how to work the crowd, comp a drink and indulge in the art of hospitality every night. Now, sadly, as Asmalımescit and other traditional dining zones go upmarket, the only trace of that old school proprietorship is found in yellowed photos on wall. In this context, Hüseyin — a boisterous host in an exceedingly sterile market — is almost as odd a fit as Mohti’s concept: thoroughly home-style Black Sea cooking in a meyhane setting…. (to read more of this review, click here). Like any place with real character, this spot is better known by its nickname: “the carwash meyhane.” Located, naturally, above a now defunct carwash, this small, no-frills meyhane — more commonly referred to as “otoyıkamacının üstü” or “Erkal’ın Yeri” — is amicably run by a group of brothers who hail from eastern Turkey’s city of Van and who keep the place humming with a distinct sense of good cheer. A tiny kitchen in back, barely big enough to hold the one chef works inside it, turns out a constant stream of lip smacking pan-fried liver and grilled fish. It doesn’t have that Taksim view but the the presence of the police station next door adds a nice element to the ambience.